Uploaded my art video to YouTube. “Prom” explores social customs/psychological issues/law/culture/sexual exploitation. Not my usual mode of exploring the universe. You can view more of the installation on my website: Prom -Installation Pictures The picture below is the “carpet” section on which the Prom dress and mannequin are installed. 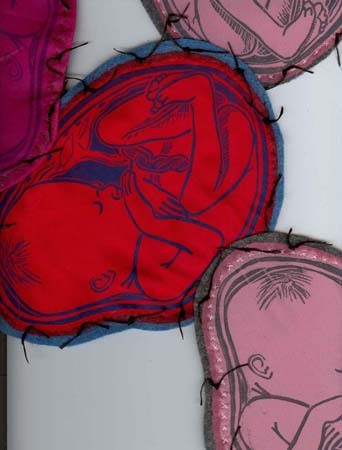 Each fetus is a linocut print on colored silk-backed with felt and hand “sutured” with embroidery floss. The floss is manipulated with acrylic medium to form the points of the “barbed wire” that has trapped the young women of the Prom. This video signals a real departure in my work. I will explore what is important. I will not edit my beliefs. More good news on the project completion front: Today I should finish the first of the four 5 x 7 foot panels of “The Man Who Couldn’t Hear Orange.” The other panels are coalescing into their final versions. I will post detail pictures-I don’t have a space large enough, at the moment, to get a full shot of the panels. This too shall arrive when needed! I’ve been busy the past week-hands on artwork on the Man Who Couldn’t Hear Orange. Making some odd discoveries about the finishing of the background textile area. Serendipitous solutions happening. Will post pix when finished with the oddity section! Wanted to share a website for printmakers. I joined up and made a swell page in under and hour. It’s Free! I ended up with a page /picture gallery that can be viewed as a slide show. Artist’s statement. You can upload video/links/and blog on the site. Looks very clean and professional. This is the link to my page-check it out and see if it suits your needs! Today’s print is a drypoint collograph. A direct and inexpensive way to print. Does require a press! The plate is made from matboard, coated front and back with artist’s acrylic gesso. ( Usually 3 times front/twice back. Let dry between coatings. You can texture the plate with brushstrokes, or make a relatively smooth surface.) The front and back are sprayed with an acrylic coating-twice each side). All you need is an etching needle, or some similar sharp point to draw into the plate. I used oil printers ink-not too stiff! and a tarlatan to wipe/finish wipe with newspaper. I used a strong, colored Japanese paper-wet! to print. 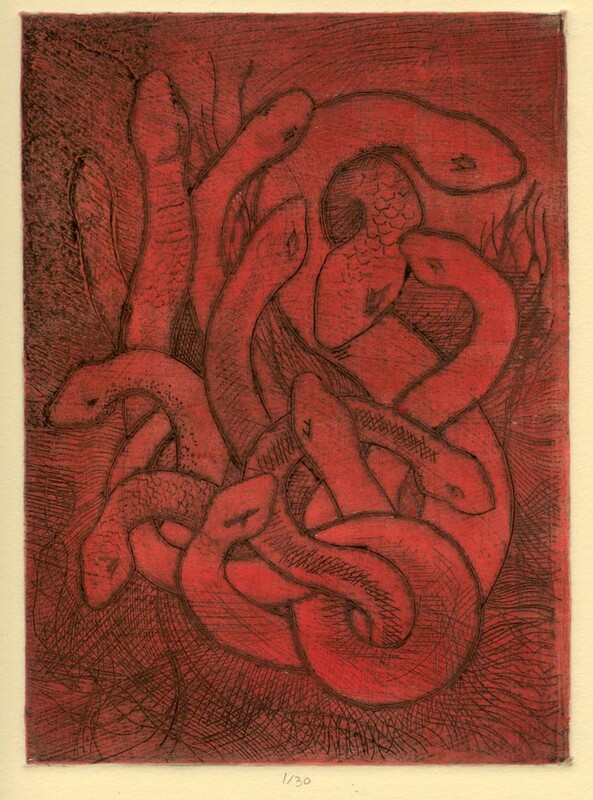 This print was Chine collé’d to Tan Rives BFK when the original print had dried. I can get at least 10-20 images from a plate. Since drypoint can be so unforgiving, I find this frees me up to be more experimental. So much cheaper than copper! Clean up should use very little liquid/solvent. The more wet the plate gets, the shorter time it will last. The liquid seeps into the lines of the plate and the paper absorbs it. A good idea to edition the plate in one or two sessions. I usually prepare multiple plates at a time-in modest sizes-so i have a stock on hand when the mood strikes. If you have any questions-contact me!